I’ve just started a new job and I’m happy that the show helps me in creating an balance between both worlds. 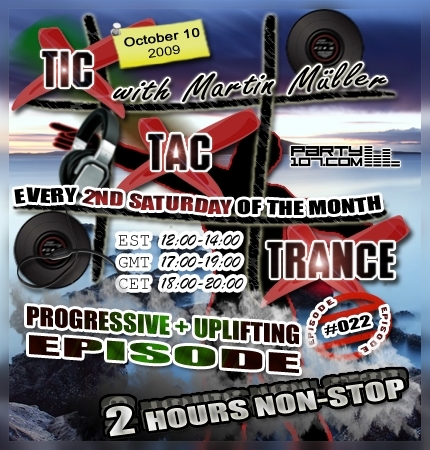 Episode #022 of Tic Tac Trance will be broadcasted on October 10 2009 on Party107 and will feature an 2 hour mix from myself. As always my set will feature the newest and lastest records and some exclusive upfront material. This two hour melodic journey will start at proggy 128 beats per minute and ends with peak time uplifters! I’ll also unveil a new mashup I did exclusively for this show.